Abraham Lincoln is considered one of the greatest presidents in American History. He was born to an extremely poor family in rural Kentucky. His family moved from Kentucky to Indiana and eventually to Illinois. Even though he received no formal education, he taught himself enough to become a lawyer and a great politician. He faced many hardships in his early life including the death of his mother and one of his sisters. When he became President in 1860, he had one of the biggest challenges ever. The Issue of slavery was literally tearing the nation apart. Within six months of his election, there were eleven states that seceded from the Union. He was forced to used military power to try to return them into obedience. In the spring of 1861, the war had started. Lincoln faced many challenges during his brief, almost one term presidency. He had to keep northern support for the war, keep Europe out of the war, and ultimately win the war. The entire time he said that his only goal was to keep the Union together, not to end slavery. List a few things that you see in this picture. What were two hardships he faced in his early life? How many states left the Union within 6 months of his presidency? What were some of the challenges that Lincoln faced during the war? True or False? Lincoln was once a lawyer. What was Lincoln’s overall goal during the Civil War? What was Abraham Lincoln’s Early Life like? How was he able to president if he wasn’t educated? What was Lincoln’s life like? Which of these was the most important thing Lincoln did? Why is Lincoln a famous president? Who do you know in history who has overcome great challenges? What challenges did Lincoln Face as a president? Which of these seems the most difficult? What was Lincoln’s main goal as a president? How is this different than people popularly think about him? SWBAT Identify identify key parts of Abraham Lincoln’s life and explain the problem slavery posed during his presidency. Lincoln was born on Feb. 12, 1809, in a log cabin in Hardin (now Larue) County, Ky. Indians had killed his grandfather, Lincoln wrote, “when he was laboring to open a farm in the forest” in 1786; this tragedy left his father, Thomas Lincoln, “a wandering laboring boy” who “grew up, literally without education.” Thomas, nevertheless, became a skilled carpenter and purchased three farms in Kentucky before the Lincolns left the state. Little is known about Lincoln’s mother, Nancy Hanks Lincoln. Abraham had an older sister, Sarah, and a younger brother, Thomas, who died in infancy. Lincoln’s mother died in 1818, and the following year his father married a Kentucky widow, Sarah Bush Johnston. She “proved a good and kind mother.” In later years Lincoln could fondly and poetically recall memories of his “childhood home.” In 1828 he was able to make a flatboat trip to New Orleans. His sister died in childbirth the same year. Lincoln served one term (1847-49) as a member of the U.S. House of Representatives, where he opposed the Mexican War. He did not run for Congress again, returning instead to Springfield and the law. Lincoln “was losing interest in politics” when the Kansas-Nebraska Act was passed by Congress in 1854. This legislation opened lands previously closed to slavery to the possibility of its spread by local option (popular sovereignty); Lincoln viewed the provisions of the act as immoral. Although he was not an abolitionist and thought slavery unassailably protected by the Constitution in states where it already existed, Lincoln also thought that America’s founders had put slavery on the way to “ultimate extinction” by preventing its spread to new territories. He saw this act, which had been sponsored by Democratic Senator Stephen A. Douglas, as a new and alarming development. Lincoln ran for US Senator against Stephen Douglass. They held a series of famous debates all across the state of Illinois. Douglas, Lincoln insisted, did not care whether slavery was “voted up or voted down.” By his vigorous showing against the famous Douglas, Lincoln won the debates and his first considerable national fame. He did not win the Senate seat, however; the Illinois legislature, dominated by Democratic holdovers in the upper house, elected Douglas. Abraham Lincoln faced many difficulties as a president. His fame comes, in the most part for the way that he overcame those difficulties. His first difficulty occurred right after he was elected president. Within six months of his election, 11 states decided to leave the Union. These southern states seceded because they felt like Lincoln was going to take away their institution of slavery. Lincoln had to try hard in order to figure out if there was a peaceful way to keep them in the Union. His attempts proved futile, as the South was determined to leave. Fort Sumter, a federal fort in South Carolina was claimed and controlled by the south. When Lincoln tried to keep control of the Federal fort, southern rebels fired on and captured the fort. The Battle of Fort Sumter, April 12-13 1861, is considered the start of the Civil War. Now that the South was determined to fight and maintain its independence, Lincoln was resolved to keep them part of the Union. He immediately called for a volunteer army. Unfortunately for much of the course of the war, Lincoln had to replace general after general in this “Union” army. As promising as the Union outlook was at the beginning of the year, there would be many problems and disappointments before 1863 ended. Lincoln would be forced to deal with numerous commanders who failed to understand that the main objective of the Union military machine should be defeating the Confederate armies, not merely occupying enemy territory. 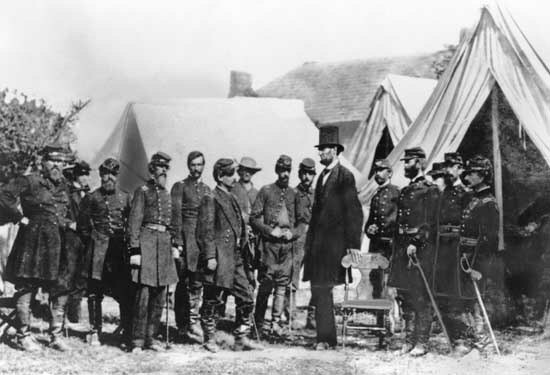 Lincoln often had to beg his commanders to take action, or relieve and replace a general when he failed to prosecute the war in an aggressive manner. Throughout the war, Lincoln faced three major political challenges. First, he had to keep the public confidence in the war going. By all accounts, the South was winning the war until about 1863. After the second year of the war, many in the North started to lose hope and wish for peace with the south. Lincoln nearly lost the election of 1864 if it hadn’t looked like the war was winding to an end. Secondly, Lincoln had to keep Europe out of the war. Many in Europe wanted to side with the South. Southern cotton was an important staple for the economy of Europe. Further, England wanted revenge on the United States for losing the war of 1812. Lastly, Lincoln had to work to keep the Border States from leaving the Union. He achieved these last two aims by Signing the Emancipation Proclamation. The Emancipation Proclamation declared all slaves living in territories and states in rebellion against the United States to be free. It did not, however, free the enslaved Africans living in the Border States. This kept the border states from seceding, but it also shifted the cause of the war away from the issue of states’ rights and the 10th amendment, and towards the issue of slavery. Europe did not want to join the pro-slavery side. Why did Lincoln’s father grow up without an education? How long did Lincoln attend schools? What happened to Lincoln’s family in 1818? Using context clues and what you already know, which word best describes the meaning of melancholy? What war did Lincoln oppose while he was a member of the US House of Representatives? What law made Lincoln want to reenter politics? True or False. It is considered that Lincoln won most of the Lincoln Douglass Debates. Why was Lincoln famous as a president? When did the Civil War begin? Why did Lincoln have to keep replacing Union Generals? What were the three political challenges that Lincoln faced during the war? Why did Europeans want to side with the South? What did Lincoln do to keep Europeans out of the war? True or False. The Emancipation Proclamation freed the slaves. 1 Abraham Lincoln lived during an exciting time of growth and change in the United States. Manifest Destiny was helping to expand the country Westward. A war with Mexico and taking Indian land expanded the country all the way to the west coast. Changes were happening in Illinois, too. Lincoln earned his law license and settled in Springfield, which soon became the state capital. 2 After working on the farm for so many years, Lincoln was certain he didn’t want to go back to that, but he still wanted to help people. He studied law and became a lawyer. He was famous for his honesty. Later, he tried to become a politician. He found that he liked being a politician, because he could help a lot more people than he could as a farmer. 3 It was about this time that Lincoln married a lady named Mary Todd. She was from an important family in Kentucky that had political connections, but more important than that, they cared for each other. In 1847, Lincoln was elected to congress for his first and only term, and they moved to Washington. After serving that term, they moved back to Illinois where Lincoln concentrated on practicing law. 4 The family lived quietly for several years until 1854, when Lincoln stepped back into the political spotlight over the slavery issue. Stephen Douglas, an Illinois senator, had broken a political deadlock in Washington with a bill that would allow Kansas and Nebraska to choose whether they wanted to be free or slave states. Lincoln didn’t think there should be any slavery in the United States. It was because of his hard work that the Whig party, which he belonged to, became the Republican Party. Suddenly he found that the whole country was listening to him. 5 In 1858, Lincoln had a series of seven debates with Stephen Douglas, so people could hear what the issues were, and know where their two parties stood. It also helped them see what kind of men the two candidates were. Through the debates, Lincoln gained a national reputation and the nomination for the Presidency, which he won. People in the southern states were afraid of what he was planning to do, which would change their way of life. 6 Almost as soon as he came to office, Lincoln was faced with one of the hardest things a President can face. Several states had decided to break away from the union over the issue of state’s rights. Lincoln did not believe they could legally break away like that and was determined to force them back, if necessary, to preserve the union. The resulting Civil War nearly tore the country apart. Lincoln knew the terrible price the people were paying and did not want it to be in vain. He was sure the whole country would rise afterward and be greater than ever. He faced many other difficulties during his presidency. He had to keep firing and getting new generals during the war, he had to keep the Border States in the union, he had to keep the public wanting to fight the war, and he had to keep Europe out of the Civil War. All of these problems were solved with intelligence and hard work. 7 In 1864, Lincoln was elected to a second term as President. He did not hold office very long the second time before he was assassinated by John Wilkes Booth on April 14, 1865. Booth thought he was helping the South, but he didn’t. 8 Lincoln was a thoughtful, generous man who worked hard to improve himself and the lives of others. He was a farmer, a lawyer, a politician, and even an inventor. Though many people thought he was an ugly man, they soon learned to pay attention to his character, not his looks. He turned out to be one of the best presidents the United States has ever had. Why did Lincoln like being a lawyer and state congressman? How many terms did Lincoln serve as congressman in Washington? Why did the Southern states fear Lincoln’s election as president? How many terms did Lincoln serve as president? If Lincoln had to call up thirty-seven thousand troops the first year of the Civil War, two hundred thirty-nine thousand troops the second year and two hundred seventy-eight thousand troops the third year, how many troops did he call up to fight? Why do you think Lincoln is considered one of our greatest presidents?